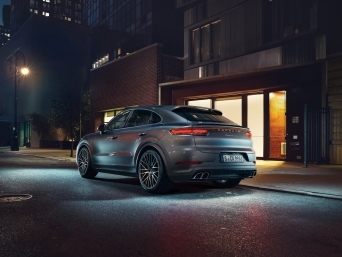 This is the perfect specification for the driver and passenger: 20-inch Macan Turbo wheels with Jet Black Metallic paint finish, ParkAssist (front and rear) including reversing camera, Comfort lighting package, 14-way electric seats (front) with memory package, privacy glass, 75-litre fuel tank, Porsche Active Suspension Management (PASM), 18-Inch collapsible spare wheel, Power steering Plus, panoramic roof system, roof rails in aluminium painted Black , heated seats (front), automatically dimming exterior and interior mirrors. Please contact us on 01142564455 or info@porschesheffield.co.uk for more information. This vehicle is the perfect specification for the driver and passenger: 21-inch Panamera SportDesign wheels (Jet Black Metallic paint finish), Sport Chrono stopwatch instrument dial in Crayon, painted air outlet trims, preparation for towbar system, privacy glass, rev counter instrument dial in Crayon, rear wiper, four-zone automatic climate control, roof lining grab handles in Alcantara®, ambient lighting, Power steering Plus, SportDesign package painted in Black (high-gloss), heated multifunction sports steering wheel in carbon, ioniser, panoramic roof system, heated seats (front and rear), Carbon interior package, ParkAssist (front and rear) including reversing camera, LED main headlights in Black with matrix beam, including Porsche Dynamic Light System Plus (PDLS Plus), BOSE® Surround Sound System, Head-Up Display, USB interface in rear, Porsche Rear Seat Entertainment. This example is the perfect specification for the driver and passenger: painted rear side air intake grilles, steering code, rear wing painted in Black (high-gloss), wheels painted in Black (high-gloss), door handles painted in Black (high-gloss), side window trims and window triangle trims painted in Black (high-gloss), Instrument dials in crayon, GTS interior package, Porsche Doppelkupplung (PDK), heated seats, rear wiper, cruise control, heated multifunction steering wheel, two-zone automatic climate control, LED main headlights including Porsche Dynamic Light System Plus (PDLS Plus), ParkAssist (front and rear) with reversing camera, electrically folding exterior mirrors, ISOFIX child seat mounting points on front passenger seat, BOSE® Surround Sound System. This example is the perfect specification for the driver and passenger: Racing Yellow seat belts, ParkAssist (front and rear) including Surround View, Light design package, Adaptive Sports seats Plus (18-way, electric) with memory package, rear-axle steering, Sports exhaust system in Black, PASM sports suspension (10 mm lowered), wheel centres with full-colour Porsche Crest, Porsche Dynamic Chassis Control (PDCC), GT sport steering wheel in leather, front axle lift system, electric slide/tilt glass sunroof, Porsche Crest embossed on headrests (front seats), privacy glass, 20/21-inch RS Spyder Design wheels, Carbon interior package, fire extinguisher, roof lining in Alcantara®, electric folding exterior mirrors including courtesy lighting, LED-Matrix headlights incl. 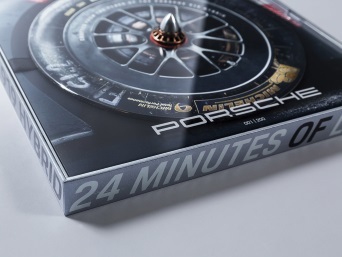 Porsche Dynamic Light System Plus (PDLS Plus), Sport Chrono Package incl. mode switch, BOSE® Surround Sound System, automatically dimming interior and exterior mirrors with integrated rain sensor. This stunning one-owner car comes with an array of features including: 20-inch Carrera Sport wheels painted in Black (high-gloss), tinted taillights, Porsche Doppelkupplung (PDK), heated seats, cruise control, heated multifunction steering wheel, roll-over bars painted in exterior colour, two-zone automatic climate control, ParkAssist (front and rear), Power steering Plus, ISOFIX child seat mounting points on front passenger seat, BOSE® Surround Sound System. 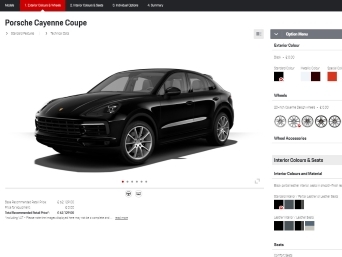 This stunning car in the perfect specification for the driver and passenger: rear side air intake grilles painted, SportDesign package painted in Black (high-gloss), Bi-Xenon main headlights in Black including Porsche Dynamic Light System (PDLS), instrument dials in Carmine Red, GTS interior package, Porsche Doppelkupplung (PDK), heated seats, cruise control, heated multifunction steering wheel, roll-over bars painted in exterior colour, two-zone automatic climate control, ParkAssist (front and rear) with reversing camera, electrically folding exterior mirrors, ISOFIX child seat mounting points on front passenger seat, BOSE® Surround Sound System. This example is the perfect specification for the driver and passenger: 21-inch Panamera SportDesign wheels (Jet Black Metallic paint finish), painted air outlet trims, preparation for towbar system, privacy glass, rear wiper, four-zone automatic climate control, Lane Keep Assist incl. speed limit indicator, roof lining grab handles in Alcantara®, ambient lighting, power steering Plus, SportDesign package painted in black (high-gloss), heated multifunction sports steering wheel in carbon, ioniser, panoramic roof system, heated seats (front and rear), comfort access, Carbon interior package, exterior mirrors painted in Black (high-gloss), door handles painted in Black (high-gloss), ParkAssist (front and rear) including reversing camera, LED main headlights in Black with matrix beam, including Porsche Dynamic Light System Plus (PDLS Plus), BOSE® Surround Sound System, Head-Up Display, USB interface in rear, Porsche Rear Seat Entertainment. Please contact us on tel: 01142564455 or info@porschesheffeld.co.uk for more information. This example is the perfect specification for the driver and passenger: 21-Inch Sport Classic wheels painted in Black (High-Gloss), sports tailpipes in Black, side window trims in Black (high-gloss), speed limit indicator, 14-way electric seats (front) with memory package, SportDesign sideskirts, privacy glass, 75-litre fuel tank, Porsche Active Suspension Management (PASM), electrically extending towbar system, Power steering Plus, panoramic roof system, Porsche Crest embossed on headrests (front seats), roof rails in aluminium painted Black, heated seats (front), heated windscreen, automatically dimming exterior and interior mirrors in brushed aluminium. Please contact us on 01142564455 or info@porschesheffeld.co.uk for more information.